~ Attractive & versatile , Argie 15 offers fun for the whole family. ~ Multi-purpose, can be rowed, motored or sailed, space for camp-cruising on lakes and rivers. ~ Simple stitch and glue method, build with minimum of tools, no previous boatbuilding experience & little space. ~ Step-by-step instructions included in plans. ~ Ideal quality time project for Dad with Junior's help or practical winter project to fight off cabin fever. 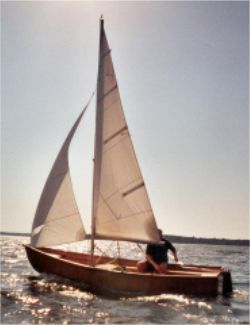 ~ Build as a school project then use for training young sailors in the school sailing club. ~ Built-in flotation compartments & simple sail plan make her great for learning to sail at any age. ~ Drawings now include optional full-length side seats.